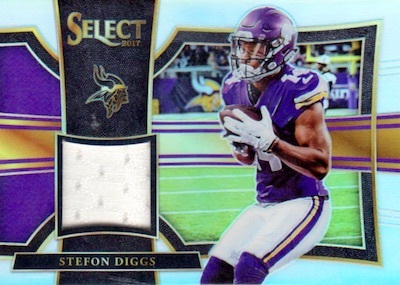 A familiar mashup of Prizm technology, colorful backgrounds, and die-cut designs, 2017 Panini Select Football takes NFL collectors on a wild ride. Each hobby box contains two autographs, one relic and 14 Prizm cards, with five being numbered. While the hits are the same as 2016, the amount of numbered Prizms increases from three. However, 2016 promised an XRC insert in every box, which are more rare in 2017. Continuing the triple-tiered setup, the 2017 Panini Select Football checklist features base Concourse (30 per box), Premier Level (10 per box) and Field Level (1:6 packs). 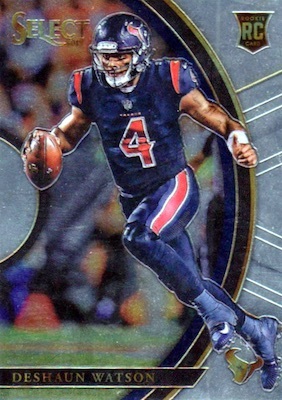 Prizm parallels include Silver, Tri-Color, Blue, Maroon, Orange, Tie-Dye, Gold, Green and Black, while Premier adds Light Blue Die-Cut versions, among others. 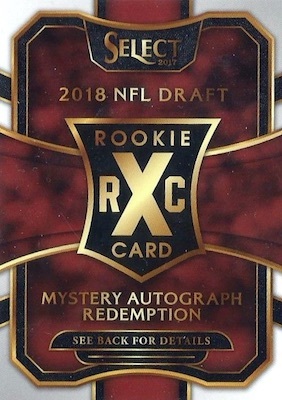 Although the '17 rookie class has several names of note, 2017 Select NFL also looks ahead to 2018 draftees with XRC redemptions that fall three per case, or 1:4 boxes. 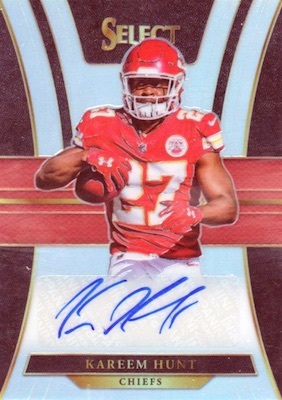 Many of the same die-cut and Prizm elements are carried over to the 2017 Panini Select Football hits, as the main Signatures insert has nine parallels, including four die-cuts. 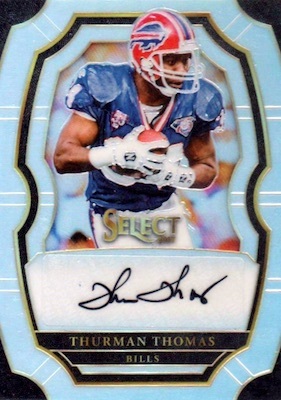 More rare at 199 copies or less, the Rookie Signatures cards cover first-year players. In addition, the Rookie Signature Memorabilia set adds a relic piece along with multiple parallels, and Jumbo Rookie Signature Swatches goes even more limited with print runs under 100. Combining to average one per box, 2017 Panini Select Football memorabilia sets include Prime Selections Prizm, Select Swatches, Jumbo Rookie Swatch Prizm and Sparks Prizm. Premium versions offer brand logos, nameplates, tags and NFL shields. 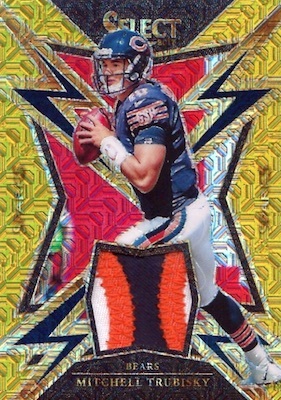 PRIZM PARALLELS: Silver, Tri-Color #/199, Blue #/149, Maroon #/99, Orange #/49, Tie-Dye #/25, Pink #/10, Gold #/10, Green #/5, Black 1/1. PRIZM PARALLELS: Silver, Tri-Color #/149, Light Blue Die-Cut #/99, Purple Die-Cut #/75, Neon Green Die-Cut #/49, Tie-Dye Die-Cut #/25, Gold Die-Cut #/10, Green Die-Cut #/5, Pink Die-Cut #/4, Black Die-Cut 1/1. PRIZM PARALLELS: Silver, Tri-Color #/99, Copper #/75, Tie-Dye #/25, Gold #/10, Green #/5, Pink 1/1, Black 1/1. 20 cards. 3 per case, on average. Shop on eBay. PRIZM PARALLELS: Tie-Dye, Gold, Black. 58 cards. Shop autographs on eBay. PRIZM PARALLELS: Light Blue #/49 or less, Tie-Dye #/25 or less, Gold #/10 or #/5, Green #/5, Black 1/1. DIE-CUT PRIZM PARALLELS: Tie-Dye #/25 or less, Gold #/10 or #/5, Green #/5, Black 1/1. 39 cards. Shop rookie autographs on eBay. PRIZM PARALLELS: Light Blue #/49 or less, Tie-Dye #/25 or less, Gold #/10, Green #/5, Black 1/1. DIE-CUT PRIZM PARALLELS: Tie-Dye #/25 or less, Gold #/10, Green #/5, Black 1/1. 56 cards. Shop autographs on eBay. PRIZM PARALLELS: Purple #/49 or less, Tie-Dye #/25 or less, Gold #/5 or #/10**, Green #/5, Black 1/1. 42 cards. Shop rookie autographs on eBay. PRIZM PARALLELS: Purple #/49 or less, Tie-Dye #/25 or less, Gold #/10, Green #/5, Black 1/1. 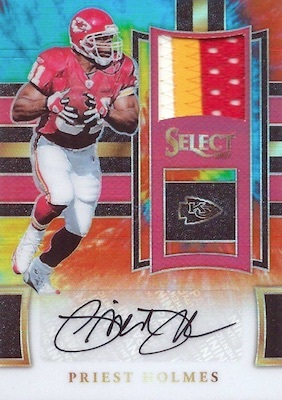 PRIZM PARALLELS: Copper #/49 or less, Tie-Dye #/25 or less, Gold #/10, Green #/5, Black 1/1. 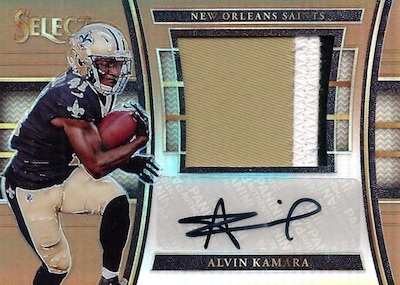 PRIZM PARALLELS: Gold #/10, Green #/5, Black Tag 1/1, Black Brand Logo 1/1, Black NFL Shield 1/1. 25 cards. Shop rookie autographs on eBay. 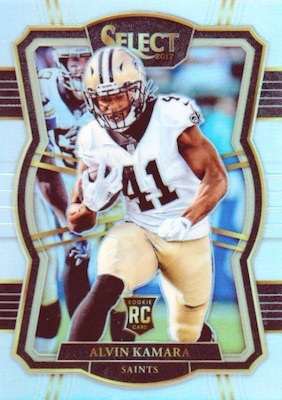 PRIZM PARALLELS: Gold Jersey Number #/10, Green Team Logo #/5, Black Laundry Nike 1/1, Black Brand Logo 1/1, Black NFL Shield 1/1. 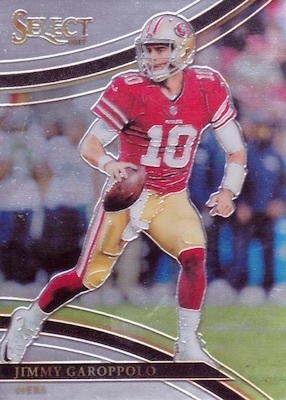 PRIZM PARALLELS: Copper #/75 or less (No Kelley*), Tie-Dye #/25 (No Kelley*), Gold #/10 (No Kelley*), Green #/5, Black 1/1. 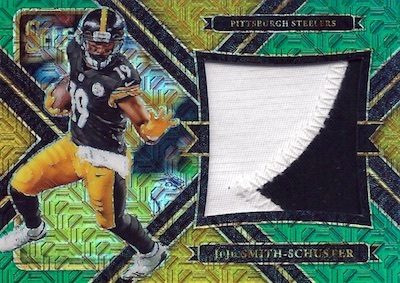 PRIZM PARALLELS: Gold #/10, Green #/5, Black Laundry Nike Swoosh 1/1, Black NFL Player's Logo 1/1, Black NFL Shield 1/1. View the 2017 Panini Select Football checklist spreadsheet. What a strange checklist. The vets and retired autos are almost solely mid tier guys. There is none of the usual Manning, Montana, Rice, Brees, Rodgers etc. will there be a retail version of select. have a great weekend. Unusual to pull an Award Winners autograph that I’ve only found in Illusion Football Box Toppers from one of my packs. It was not enclosed…just sitting in there. I wonder why when Panini opens their “sample” boxes, they never get all the points cards like I do! It is ridiculous to get a points card as main hit like the jersey/auto. Not only is it worthless, but’s no fun opening packs – kills the excitement. The Prizm cards have a rainbow effect on the front that is pretty clear when compared to a base version. I believe that these also list Prizm on the back of the card.